How to remotely wipe out all data from a device? Don’t put your confidential data at risk and choose to remotely wipe out all data from a device if lost or stolen. This feature will reset the device to factory settings and there will be no way of accessing its content anymore. 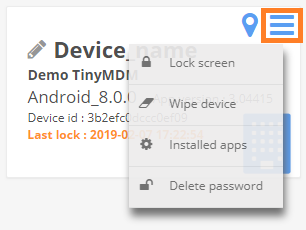 Note: if you need to delete a device from your account, follow these steps and it will disappear from the dashboard within 24h. Once initiated, the action won’t stop until the device is completely wiped. Corporate but also personal data will be deleted (including files, contacts, calendars, settings, etc.) so please make sure everything is regularly backed up. You will still be able to see the device in your dashboard with the last wipe out request time and date, but there will be no way of reversing the process.